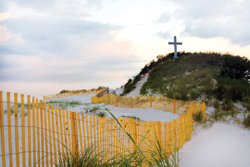 A 10-foot cast-concrete cross is the inspiring sight that greets visitors to Pensacola Beach, Florida. It stands vigil on the south side of Fort Pickens Road and has withstood hurricanes that have obliterated nearby dunes. Many people wonder why and try to figure out how. The cross commemorates the first Christian mass held in the United States and was erected by the Knights of Columbus in 1959 as part of the quadcentennial celebration of Don Tristan de Luna�s landing in Pensacola, which established America�s first European settlement. In 2009, the Pensacola Bay area will mark its 450th anniversary. In the summer of 1559, Don Tristan de Luna sailed up the Gulf of Mexico, from Mexico, with 1,500 settlers and 11 ships loaded with gear and food. In fact, Pensacola predated St. Augustine by six years and Jamestown, Virginia, which dates to 1607. But just three months later, a hurricane killed hundreds of people and destroyed the camp as well as several ships. A famine was the final straw for the ill-fated effort to bring civilization to the northern section of Florida�s Gulf Coast. Today, Naval Air Station Pensacola, �the cradle of naval aviation,� sits on the site of the original settlement. Fort Pickens, which housed Apache prisoners, including Geronimo, is still accessible to hikers, bicyclists and boaters. The fort was completed in 1834 and used until World War II, when modern weapons rendered traditional coastal defenses obsolete. Pensacola Beach is located on Santa Rosa Island, a barrier island that is part of The Gulf Islands National Seashore and offers 52 miles of unsullied, undeveloped white sand beaches and the emerald waters of the Gulf of Mexico. The beach is unincorporated and has a population of nearly 3,000. The land is bounded by a 1947 deed with the U.S. Department of the Interior. Its businesses and residents are long-term leaseholders and not property owners. Popular attractions on Pensacola Beach are novelty houses, such as the UFO-shaped Futuro and the Dome of a Home, which was designed to withstand hurricane-force winds and storm surges. Visitors and residents alike can enjoy a stroll along the Quietwater Beach Boardwalk, which includes retail shops, restaurants, nightclubs, street musicians and sidewalk artists. With a little luck, vacationers might catch a concert at the seashell stage on the Boardwalk.